Colorado Springs shooting suspect Robert Lewis Dear, right, appears via video before Judge Gilbert Martinez, with public defender Dan King, at the El Paso County Criminal Justice Center for this first court appearance. 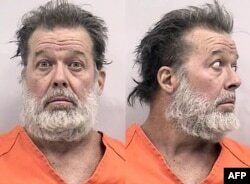 This booking photo released by the Colorado Springs Police Department shows Robert L. Dear, 57, the suspect in the Nov. 27, 2015, shooting at a Planned Parenthood clinic in Colorado Springs, Colorado. Police sources were later quoted as saying Dear uttered the words "no more baby parts" — an apparent reference to abortions performed at some clinics — as he was led away from Friday's crime scene. 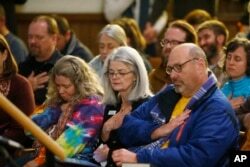 Vicki Cowart, center, executive director of Planned Parenthood of the Rocky Mountains, joins others in putting their hands on their hearts at All Souls Unitarian Universalist Church in Colorado Springs, Colo., during a vigil for victims of Friday's shooting, Nov. 27, 2015. Some abortion opponents have resorted to violence against U.S. clinics and medical practitioners that provide abortion services; several have been hit by arsonists and bombers. At least two doctors have been murdered by anti-abortion activists, the most recent in 2009, when a doctor in Kansas was slain because he performed abortions.